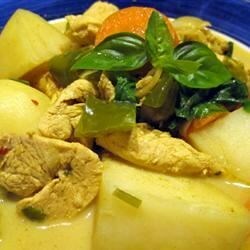 "I use Vietnamese-style curry powder found at Asian food stores (usually called 'cari'). If you can't find it, use Madras curry powder. I make mine soupy, but you can make a thick stew by reducing the amount of chicken broth and water by half. Serve with rice or French bread, or both." Heat oil in a large stock pot over medium heat. Cook chicken and onions in oil until onions are soft and translucent; remove onions and chicken from pot and set aside. Saute shallots in pot for about 1 minute, then stir in garlic, ginger, lemon grass and curry powder. Continue to cook for about 5 minutes, then stir in bell pepper and carrots. Return chicken and onion to pot and stir in chicken broth, water and fish sauce. Season with lime leaves, bay leaf and red pepper flakes. Bring to a boil and introduce potatoes. Return to a boil and pour in coconut milk. Reduce heat and simmer 40 to 60 minutes, until potatoes and chicken are tender. Garnish each dish with a sprig of fresh cilantro. I did the stew version. Considering all the ingredients, the taste was too mild for our liking. Great soup! I used 2 potato and 1 rutabaga. The store I shop at did not have lime leaves, still wonderful.